Almost 44 years ago to the day, World number one Billie Jean King took on former Wimbledon champ Bobby Riggs in an electrifying tennis match billed the BATTLE OF THE SEXES. With more than 30,000 fans cheering at the Houston Astrodome and millions more at home, the BATTLE OF THE SEXES became the most-watched televised sports event of all time. In 1973, the earnings gap was the largest ever recorded, since the Census Bureau began tracking in 1960. Men’s tennis champions were paid eight times more than women. The industry believed male athletes were faster, stronger, more competitive and more exciting to follow; however, for this match, the prize was the same amount for each competitor — a big win for gender equality. The BATTLE OF THE SEXES film narrative, based on the true story, extends far beyond tennis and even the spectacular showdown between King and Riggs. More important than its outcome is the ripple affect the event caused — the attitudes and policies that changed not only in the sport, but also across the world. The film centers around King (Emma Stone) and a small team of women’s tennis pros, who take a stand against discrimination, boycott the Pacific Northwest open and start their own tour with $1 contracts. On the road, the “Original Nine” continue to fight the establishment for equal pay, while King struggles to come to terms with her own sexuality. This loss only fuels Riggs’ sexist fire and the popular opinion that athletic leagues should be kept separate, and women athletes should be paid less. King knows what’s at stake is greater than the game. She agrees to play Riggs, and he takes every cheap shot he can against her (and women in general) in the media. Up to and even during the match, Riggs treats the battle as a show, participating in ridiculous promos and sponsorships and partying poolside instead of training. While his off-the-wall antics provide a few laughs, the story is emotional from beginning to end. Emma Stone serves up an outstanding performance as King, blending subtle warmth with fierce competitiveness. You’ll love to hate Steve Carell, who magnifies Riggs’ chauvinistic personality — at least, while he’s on the court and in front of the cameras. Privately, Riggs is surprisingly soft, and Carell strikes that balance with sincerity. 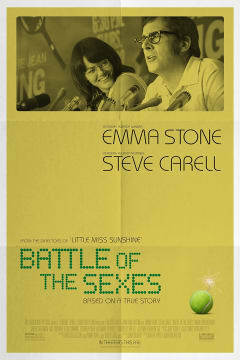 Whether you’re a fan of tennis, history or the film’s A-list cast, you’ll applaud BATTLE OF THE SEXES at AMC. Get your tickets for September 22 online or at a theatre near you. BATTLE OF THE SEXES grabbed attention and headlines at the 2017 Toronto International Film Festival (TIFF). Check out the photos and other highlights in our TIFF recap. The film also made our 15 Must-See Movies Coming This Fall list.